Yates County is a county in the U.S. state of New York. As of the 2010 census, the population was 25,348, making it the third-least populous county in New York. The county seat is Penn Yan. The name is in honor of Joseph C. Yates, who as Governor of New York signed the act establishing the county. 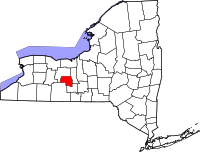 When counties were established in New York State in 1683, the present Yates County was part of Albany County. This was an enormous county, including the northern part of New York State as well as all of the present State of Vermont and, in theory, extending westward to the Pacific Ocean. This county was reduced in size on July 3, 1766 by the creation of Cumberland County, and again on March 16, 1770 by the creation of Gloucester County, both containing territory now in Vermont. On April 18, 1946, Yates gained 10 square miles (26 km2) from Schuyler and Seneca counties, which produced the current borders of Yates County. According to the U.S. Census Bureau, the county has a total area of 376 square miles (970 km2), of which 338 square miles (880 km2) is land and 38 square miles (98 km2) (10%) is water. Yates County is in the western part of New York State, northwest of Ithaca and southeast of Rochester. It is in the Finger Lakes Region. As of the census of 2000, there were 24,621 people, 9,029 households, and 6,284 families residing in the county. The population density was 73 people per square mile (28/km²). There were 12,064 housing units at an average density of 36 per square mile (14/km²). The racial makeup of the county was 97.90% White, 0.56% African American, 0.15% Native American, 0.28% Asian, 0.02% Pacific Islander, 0.36% from other races, and 0.74% from two or more races. Hispanic or Latino of any race were 0.93% of the population. 21.3% were of English, 16.5% German, 11.4% Irish, 10.7% American, 5.3% Danish and 5.3% Italian ancestry according to Census 2000. 5.46% of the population over 5 years old, mostly Wenger Old Order Mennonites, report speaking Pennsylvania German, German, or Dutch at home, a further 1.54% speak Spanish. In the county, the population was spread out with 26.70% under the age of 18, 9.30% from 18 to 24, 24.70% from 25 to 44, 23.90% from 45 to 64, and 15.50% who were 65 years of age or older. The median age was 38 years. For every 100 females there were 95.30 males. For every 100 females age 18 and over, there were 91.30 males. ^ a b "State & County QuickFacts". United States Census Bureau. Archived from the original on July 22, 2011. Retrieved October 13, 2013. ^ "U.S. Decennial Census". United States Census Bureau. Archived from the original on May 12, 2015. Retrieved January 8, 2015. ^ "Historical Census Browser". University of Virginia Library. Archived from the original on August 16, 2012. Retrieved January 8, 2015. ^ Forstall, Richard L., ed. (March 27, 1995). "Population of Counties by Decennial Census: 1900 to 1990". United States Census Bureau. Archived from the original on February 19, 2015. Retrieved January 8, 2015. ^ "Census 2000 PHC-T-4. Ranking Tables for Counties: 1990 and 2000" (PDF). United States Census Bureau. Archived (PDF) from the original on December 18, 2014. Retrieved January 8, 2015. ^ Leip, David. "Dave Leip's Atlas of U.S. Presidential Elections". uselectionatlas.org. Archived from the original on 23 March 2018. Retrieved 4 May 2018. This page was last edited on 26 February 2019, at 04:28 (UTC).